Dental implants were introduced into general dentistry in the early 1980s. Since that time, more than three million people in the US have chosen this tooth replacement method, and another half a million join their ranks every year. If you are considering becoming one of them, you may wonder, “how do I care for my implants?” Dr. Nikunj Raiyani of Hanford Family Dental Center in Hanford, CA shares this helpful advice. Before the advent of implants, tooth replacement choices consisted of a denture or a bridge. Both are sound dental solutions, with something in common – they sit on top of gum tissue. Neither has the notable characteristic of a dental implant. An implant becomes part of your body, fused solidly into jawbone much like a natural tooth root. It is then “loaded” with a crown (or other restoration) to replace the missing tooth. 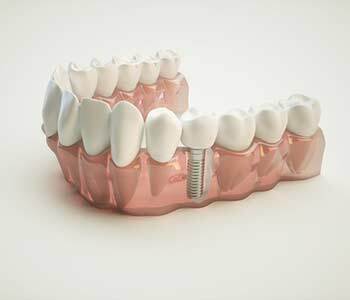 While a denture or bridge reinstates the appearance and function of a missing tooth, those restorations do not have the stability of an implant. Patients derive another big benefit from dental implants. Underlying bone provides the structure that keeps facial proportions balanced, lips full, and skin taut. Each time you bite down, roots of natural teeth provide stimulation that fortifies bone. Without that stimulus, bone diminishes. The nose gets closer to the chin, the mouth sinks inward, and skin on the lower half of the face sags. Dental implants replace this vital function of tooth roots, helping to preserve facial bone. A dental implant is made of a titanium metal alloy or other biocompatible material. The body readily accepts it, with little chance of allergy or rejection as bone bonds with the implant. From this perspective, a dental implant can realistically last as long as any other part of your body. That longevity, however, requires care – as you take care of other parts of your body (eyes, skin, joints, heart, etc.) so they continue to function properly and comfortably. The goal of caring for a dental implant is to keep it free of destructive bacteria. These organisms form a sticky bio-film, called plaque, where they thrive and multiply. If not removed with good oral hygiene, bacterial infiltration can trigger infection of tissues around the implant. This condition, called peri-implantitis can result in failure – the implant must be removed to protect the patient’s health. Wondering how do I care for my implants? In Hanford, CA, patients have multiple implant options. Oral care depends on the type of implant and restoration you have. Most implants are stand-alone replacements for missing teeth, topped with porcelain crowns. A person may have just one implant restoration, several at various locations in an arch, or even an entire arch of implanted teeth. Using a soft-bristle toothbrush and mild (non-abrasive) toothpaste, brush teeth at least in the morning and before going to bed. After every meal is better. Use a micro side-to-side motion at the gum line, cleaning around the implant crown as well as each of the other teeth. Then, use a sweeping motion away from gums to clean flat sides, and don’t forget to scrub chewing surfaces of molars. While it is essential to keep the margin of the implant restoration clean, bacteria proliferate quickly so the whole mouth should be brushed thoroughly. Floss before bedtime. An unwaxed tape-type is best, and there are flosses made specifically for people with implants. An interdental brush is like a small bottle brush, designed to clean hard-to-reach spots between teeth. This can be a good addition to your daily regimen. A water irrigator may also be a wise choice for implant longevity and overall oral health. The stream of water gently loosens debris, flushes bacteria, and stimulates blood flow to gums. 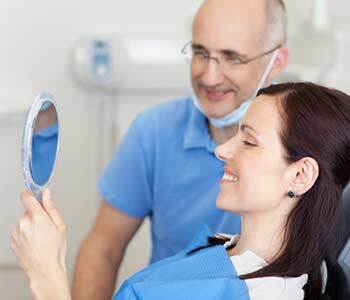 Maintain regular cleaning and examination appointments at Hanford Family Dental Center. If you have an implant-supported denture, remove it daily for cleaning. Inspect attachment points and let the dentist know right away if you see any signs of wear. Use an extra soft toothbrush to clean your gums and around implant abutments, then rinse your mouth. Brush the denture, with extra attention to the underside. Rinse before re-inserting. A weekly soak in denture cleaner helps to keep it sanitized and removes stains and odors. With good home care, healthy nutrition, and regular dental checkups, dental implants have an excellent long-term success rate. Call (559) 530-8080 to schedule a visit with Dr. Raiyani if you have further questions. What type of dental implant is used in Hanford, California patients interested in retaining dentures? How are tooth implants done by a dentist in Hanford? . Hanford, CA dentist provides tooth implants for a tooth loss solution. Hanford dentist helps patients understand why dental implants cost is worth it! Patients in Hanford, CA ask, "What are the benefits dental implants?"